The Weathered Mint Rustic Mint design comes with a bamboo pattern and is paired with the Sugar Cookie sachet. 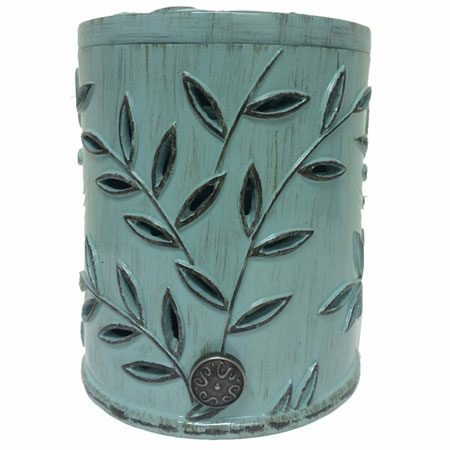 The Weathered Rustic Mint design comes with a bamboo pattern and is paired with the Sugar Cookie sachet. I was searching for a candle or diffuser for my home office that wouldn’t overpower the environment (this can sometimes be distracting). I discovered Ambrosia Scents online and ordered your Rustic Mint canister with Sugar Cookie sachet — it’s PERFECT. Not only does it produce the right amount of scent to make my office pleasant but the calming glow of the canister is relaxing to have while I’m working. I’m buying more to give as gifts! Ambrosia Scents has made all the difference in my new apartment. My next door neighbor smokes and the odor travels through the vents. I turn on my Rustic Mint canister with any one of the sachets I bought and I no longer smell the smoke. Thank you! Just bought one for my daughter’s nursery. What a difference! Stinky diaper odor is gone – woo hoo! I was looking for an alternative to messy incense and the open flames of candles, which can also be overpowering. I found the right balance with this product. I also purchased extra sachets for my car, and love it.